"Overcomers have a “finishing” anointing. They don’t merely start things. They keep on moving forward until they complete the task. Many people like to start new things. They enjoy thinking about new projects and dreaming about new opportunities. Often, these people actually start some of the things they are thinking about. The problem is they seldom finish what they start." Are you a starter, but not a finisher? Do you have difficulty staying focused and motivated to see things to completion? Are you looking for a program that will help you stay on task and finish strong? Well… you have come to the right place. 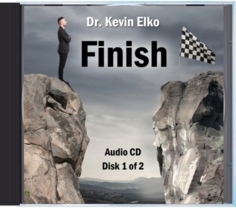 Finish, Dr. Kevin Elko’s new audio program will guide you through a proven process to not only finish what you start, but finish strong and with success! How do we know this program works? It’s the process used by the National Champion University of Alabama Crimson Tide Football Team and the Super Bowl Champion Philadelphia Eagles, along with numerous successful companies and individuals. It has been demonstrated again and again that the number one factor in the personality of successful people is an obsession to finish everything they start. They think through what projects they will take on and once selected, they organize their mind to bring the project to completion. This starts with an emotion that I introduced in the Monday Morning Cup of Inspiration called, “Enough.” It is what motivates “The Great Ones” to start all projects. Enough mediocrity, living ineffectively and personal strife, enough! This emotion is a mixture of love, destiny and positive anger which causes one to dig in their heels and take a stand. The “Finishers” are not directed by feelings which allow us to quit, but by decisions that allow us to finish. This program highlights the “Enough” culture that was behind The Alabama Crimson Tide and Philadelphia Eagles recent championship seasons. As you listen to this program you will identify the areas of your life in which you will call out enough, and then finish what you have started. This program is available in two audio CD’s or a digital download format (11 MP3 files). Click below to order the audio program in Digital Download Format (11 MP3 files in Zip File Format). You will immediately be directed to the download link where you can download your audio program. Please download the files asap as the download link will expire in one month.